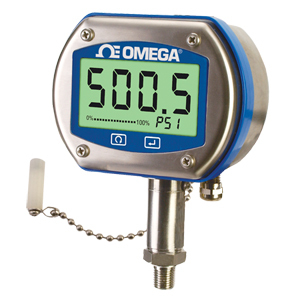 Omega’s DPG409 Series incorporates a rugged 316 Stainless Steel enclosure that is designed specifically for wash-down, sanitary, and marine applications. The large backlit LCD display features 1" high digits that make reading at distances up to 10.7 m (35') easy. DPG models are available with integral standard or sanitary pressure sensors that incorporate highly-stable silicon wafer technology which is micro-machined to precision tolerances and then has strain gages molecularly embedded. Standard features include: internal battery or external DC power supply operation, analog output, and user programmable alarms. The wireless transmitter option allows for remote monitoring, chart recording and data logging. A variety of user-configurable options and settings include: update rate, dampening, units, backlight, and auto-off. Free Software for Set-up and Configuration via USB connection as well as Charting/Logging Software and drivers for wireless data. To Order the optional Wireless Transmitter add suffix "-W", add $100 to price. Note: Compound gauge ranges have a unidirectional analog output equal to their full span; i.e. -15 to +15 psi = 0 to 10 Vdc. Note: Each unit comes complete with setup and configuration software, USB cable, 5-point NIST traceable Calibration Certificate, 2.7 m (9ft) analog output cable with ferrite, and operator's manual.